The best way to reduce cold and flu symptoms is to avoid catching cold germs in the first place. It is recommended that you follow a healthy lifestyle and diet to help reduce your risk of getting sick. It is important to wash your hands regularly and properly and to reduce exposure with people who are sick. There is no way to instantaneously kill off cold and flu viruses that are in your system, but as it wreaks havoc on your body you can help the collateral damage heal faster. Treat your body to humidified air. The secondary effects from the cold may be irritation to the nasal passages and the moisture from the air will help that. If you intend on using a vaporizer, make sure it is clean so you don’t inhale mold or bacteria. Another option is to sit in the bathroom with a hot bath. Make sure you drink lots of water or other beverages such as herbal tea or broth. Fluids will prevent dehydration, make your throat feel better, thin mucus, and reduce the risk of lung or ear infections. Avoid alcoholic and caffeinated beverages as they can contribute to dehydration. Try using a saline solution, nasal spray/drops to ease the stuffiness in your nose. It can prevent damage to the tissue and it will clear the passages and allows the mucus to move. Saline is a mixture of salt and water (similar to your tears), it is perfectly safe to use as needed. Gargling with warm salt water will help ease your sore throat temporarily. You can put half a teaspoon of salt per glass of warm water (make sure it is not too warm), try it every couple of hours. It may also help prevent against infection. Getting extra hours of sleep will help your body bounce back more quickly. You’re allowing your body and immune system to work and to help you heal. Though, this may not be entirely possible if you have obligations or a family that needs you. If possible, enlist the help of your partner, family, or friends to assist you with the kids or cooking. Your body relies on a healthy, well-balanced diet to get healthy again. Make sure you are eating frequent, nourishing meals and snacks throughout the day. Everybody’s appetite seems to be poor when they have the cold or flu, foods like soups or comfort food are better tolerated when you are ill. If you are not able to stop then try to cut back while you’re sick. The smoke can irritate the respiratory system, making your cold last longer and raising your risk of other respiratory infections. 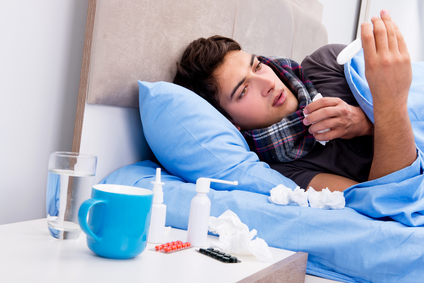 In studies, Zinc, Echinacea, Vitamin C, and Garlic do seem to help if you take them at the beginning of a cold. But there is no high quality research that proves that supplements can shorten a cold.